If you would like to be notified when I post a new article, send me an email. I'll only use the list for that purpose, and I'll mail blind cc so your address won't be any the worse for spam. 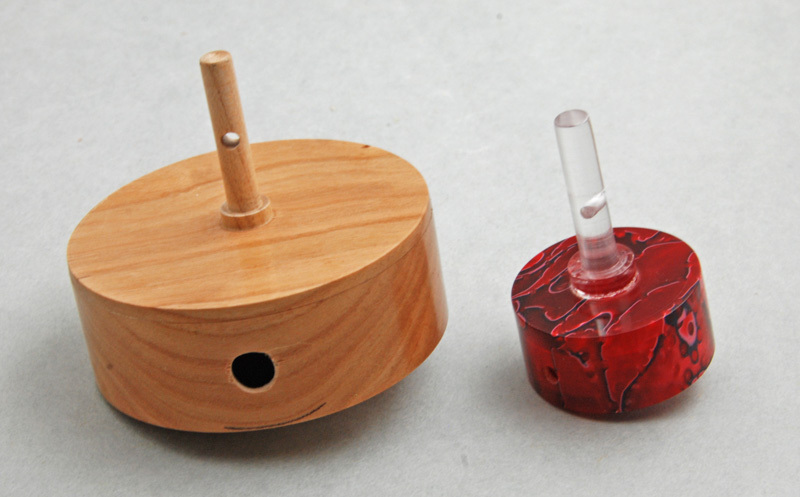 Traditionally, whistling tops are oval or acorn shaped, have a single square hole, and are made of semi-precious materials like ivory or at least boxwood or some other wood whose hardness is measured on the Mohs Scale. However whistling tops are also traditionally hard for first-timers to make work. In an effort to avoid the latter tradition this article will avoid the former tradition. 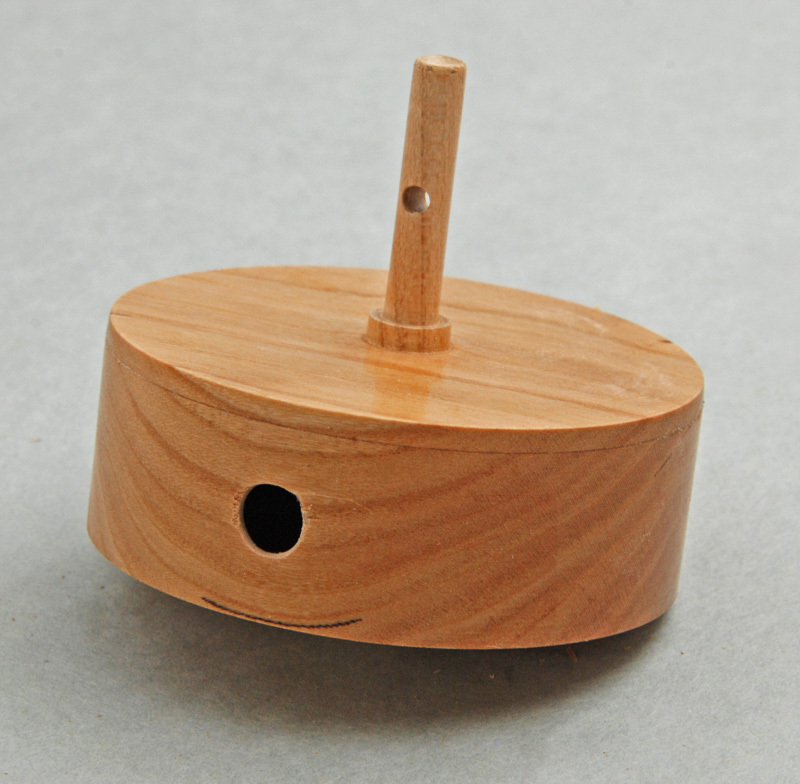 One of the critical things in making a whistling top that works is the ratio between the hole area and the volume of the chamber. On the lathe, it’s easier to actually get the volume you’re trying for if the chamber you’re turning is a simple cylinder. As tops with a low center of gravity are more stable and spin longer, this article uses a short squat point. Having experimented with various hole configurations to measure the rpm needed to whistle (I used a Foredom handset with a 1/4” collet and a stroboscopic tachometer) I found that two medium sized round holes would whistle at a lower rpm than one big round hole or even one square hole (some of my early tops looked like Swiss cheese if the tape covering the unused holes was removed). The rpm required, by the way, is in the range of 4000 to 8000, depending on the top diameter, hole configuration, and pitch of the note (yes, it’s complicated, which is one of the reasons people traditionally have trouble making them work). 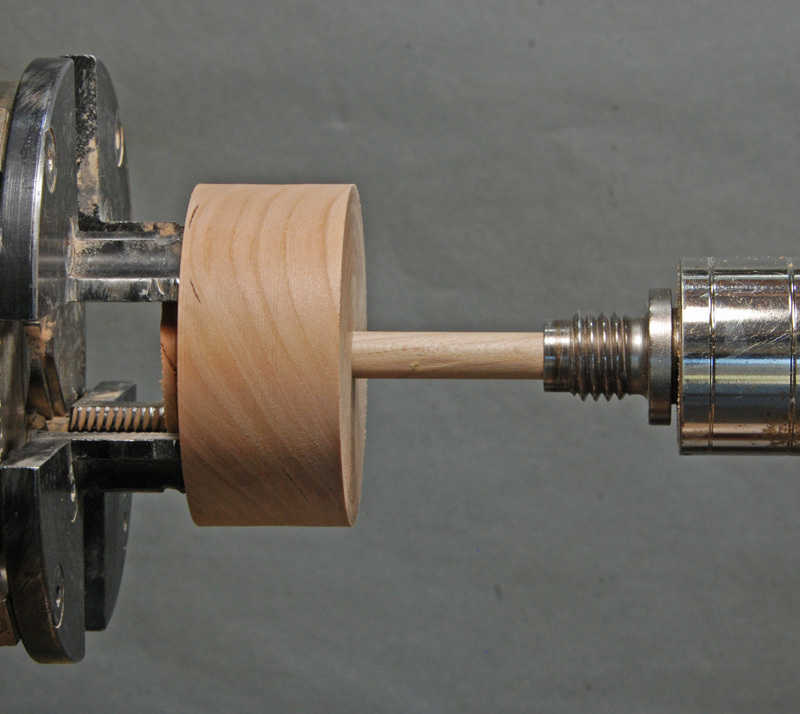 So don’t expect to be able to test the top by spinning it on the lathe (instead use a straw). Neither will you be able to make a finger spun top work. You’ll need a top launcher and pull string. Briefly, a tenon is turned on the shaft blank and an optional Corian tip blank prepared. The top body blank is turned round with a mounting tenon and then reversed. 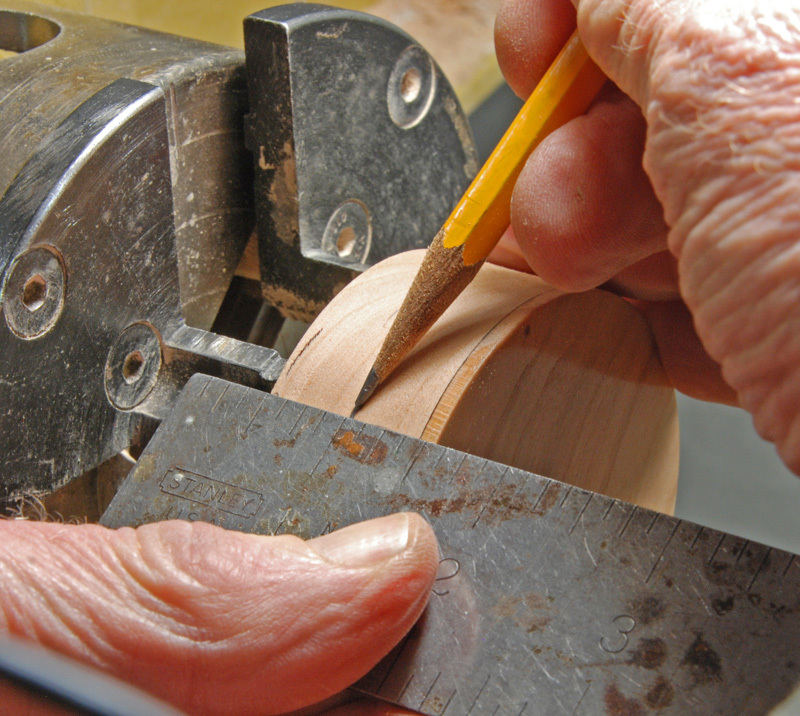 A hole to both mount the handle and indicate hollowing depth is drilled, then the shaft blank is glued in and shaped. 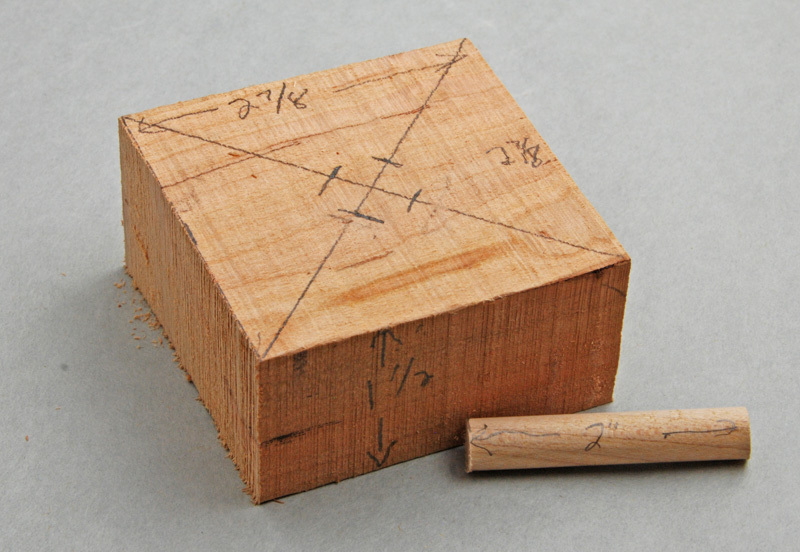 A tenon is formed on the top of the top and the top parted off. Holes are drilled in the side of the body and then the body is hollowed. The body is reversed and the tip turned and finally the top is glued together. The photos follow using #1 jaws in a Oneway Stronghold chuck, but of course you can substitute other mountings. Dennis Daudelin and Ian Salisbury collaborated in developing this article but bear no responsibility for my eccentricities or any mistakes in executing it. Cut a faceplate oriented piece that’s 2-7/8” on a side and 1-1/2” thick for the top body blank. I used cherry, but any reasonably fine grained diffuse porous hardwood will do. Use corner to corner diagonal lines to find the center, then mark the diagonals 5/16” away from center to help center the blank when it’s mounted for roughing on the lathe (a Oneway cup center tailstock is just under 5/8” diameter) as shown if Figure #1. Figure #1: Mark the turning blanks. Cut a maple 3/8” dowel 2” long for a shaft blank. If you don’t have maple dowels, cut a 2” piece of decent hardwood. Mount the shaft blank in #1 jaws in your 4-jawed chuck and turn a 5/16” diameter tenon that’s about two parting tool width’s deep as in Figure #2. 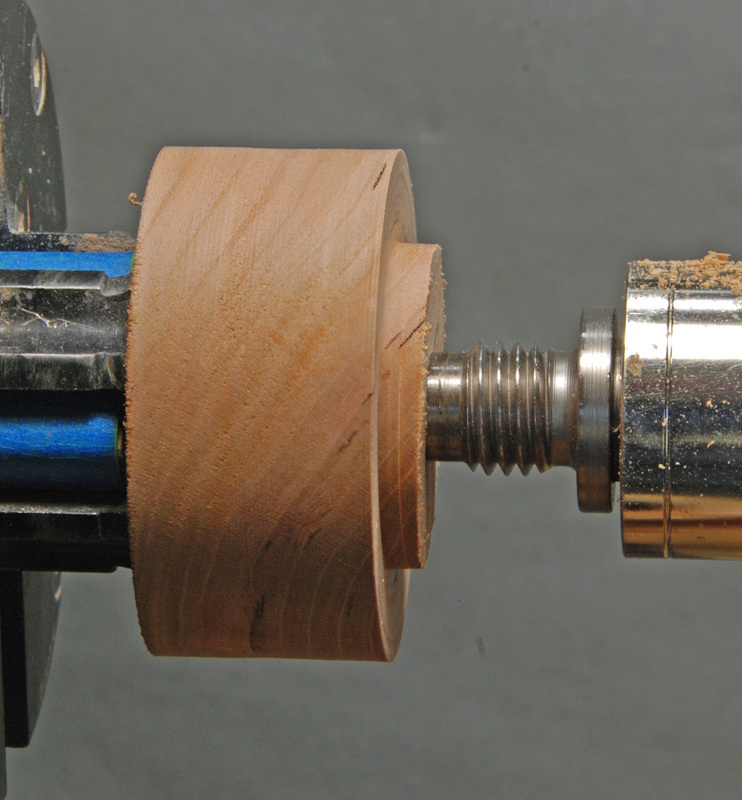 Figure #2: Turn a 5/16” tenon on the shaft blank. You can just turn a point on the bottom of the top, however wood wears quickly, at least on a basement floor, and a top with a worn point tends to travel around a lot. Corian, or some other hard plastic, is a reasonable compromise between a wooden point that’s too soft and a metal point that might damage floors. So optionally, mount a square of Corian in the #1 jaws in your 4-jawed chuck. Create a dimple for a cone center tailstock with your skew or a stub centering drill and bring up the tailstock for support. Then turn the Corian point blank to 5/16” diameter. It only needs to be 1/4" or so long, but why not turn enough for a few points while you’re at it as shown in Figure #3? Figure #3: Turn a Corian point blank to 5/16” diameter. Knock out the point of your cup tailstock center. This will let you adjust the blank to center it, as well as not put a dimple where the point should be if you choose not to use a Corian insert. Fully closed, #1 jaws don’t provide a stable platform to pin the blank to for roughing to round. If you keep your chuck cleaner than mine, if the jaws are not clamping on something the chuck may open when the lathe is on. To prevent this clamp a small scrap wood square in the chuck. 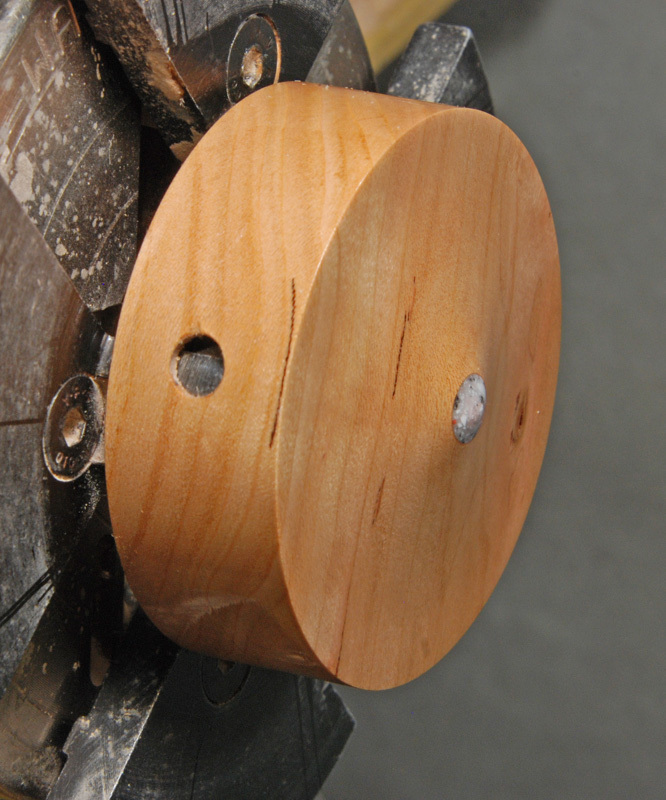 Bring up the tailstock center to gently pin the blank to the chuck as in Figure #4. You can tap the blank (with a tool handle, for instance) until the cup is centered, as in the inset of Figure #4, between the marks made earlier. Then clamp the blank securely to the jaws with the tailstock center. 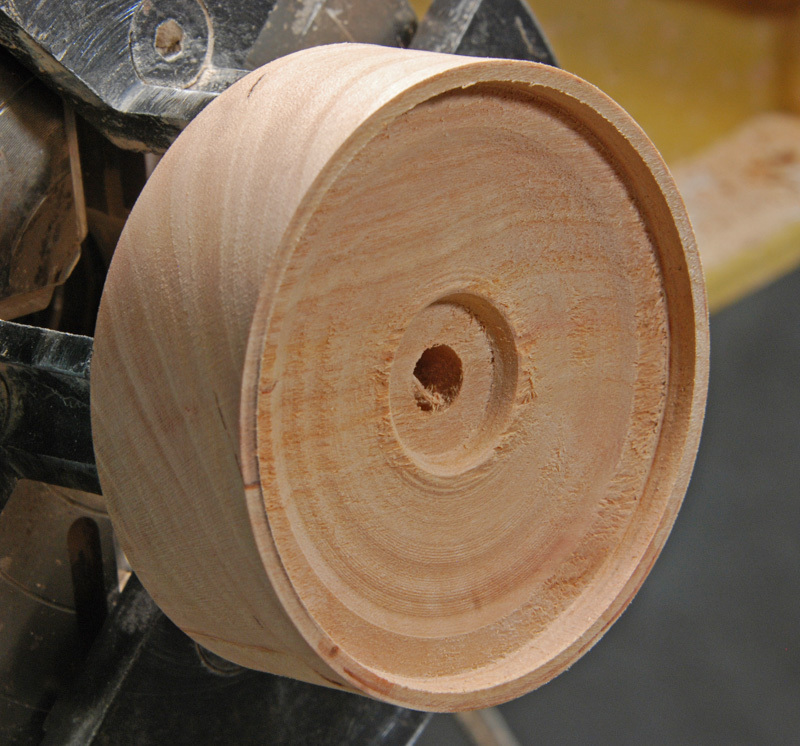 Figure #4: Mount the Top Blank for roughing round. 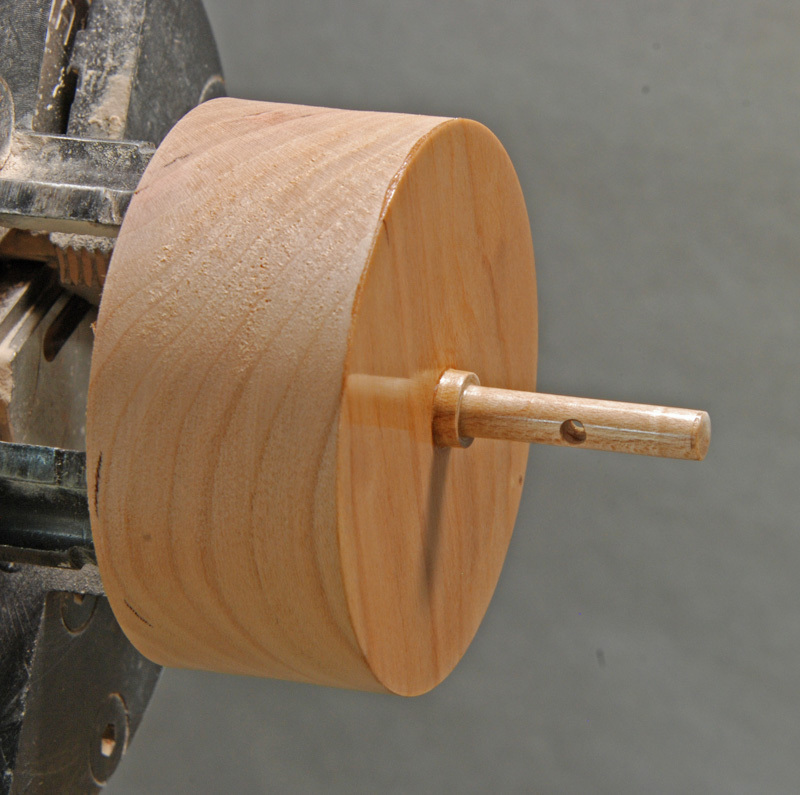 Use a small bowl gouge and turn the blank round as in Figure #5. You may wish to refine the surface with a shear scraper. 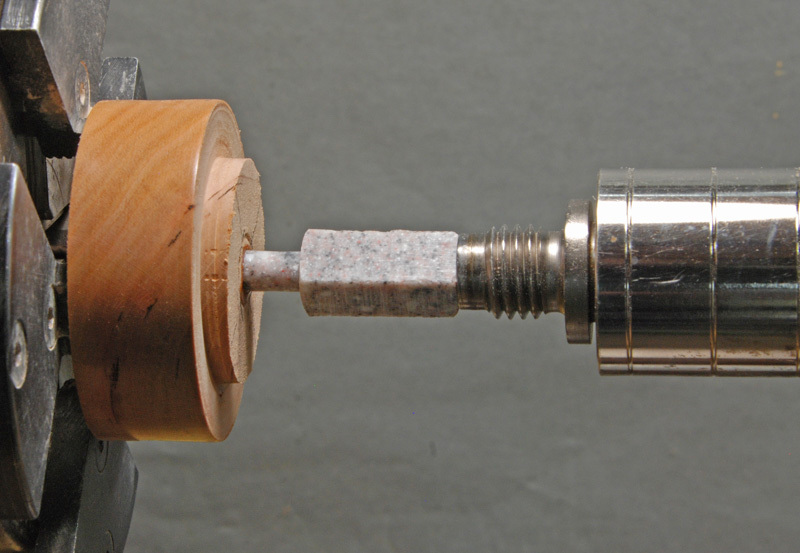 Then use a parting tool, or bowl gouge followed by a parting tool, to form a mounting tenon as in Figure #6. The tenon should be about 1-3/4” in diameter (small enough that the chuck jaws will be recessed below the side of the blank) and a parting tool width deep. Figure #5: Turn the blank round. 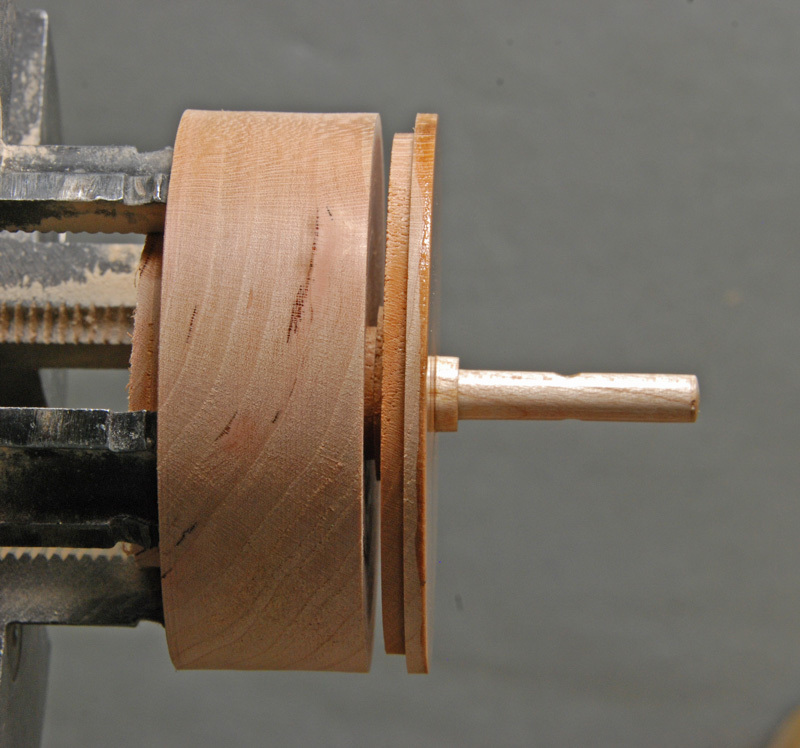 Figure #6: Turn a mounting tenon on the blank. Mount the top blank in your 4-jawed chuck via the tenon. Then true up the face of the blank. 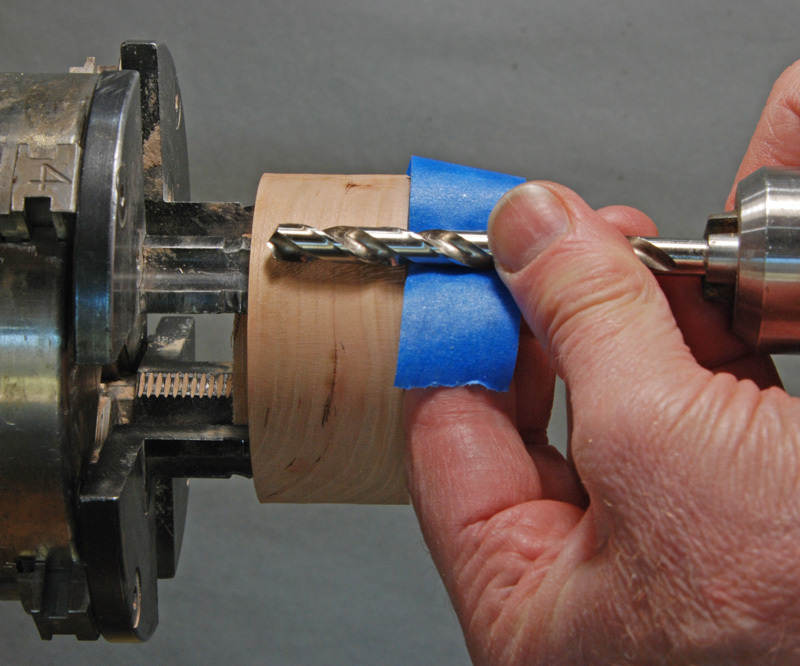 Mount a 5/16” drill bit in a drill chuck and hold it against the top blank so that the tip is about 1/8” from the shoulder of the mounting tenon and wrap tape around the bit to mark the drilling depth as in Figure #7. 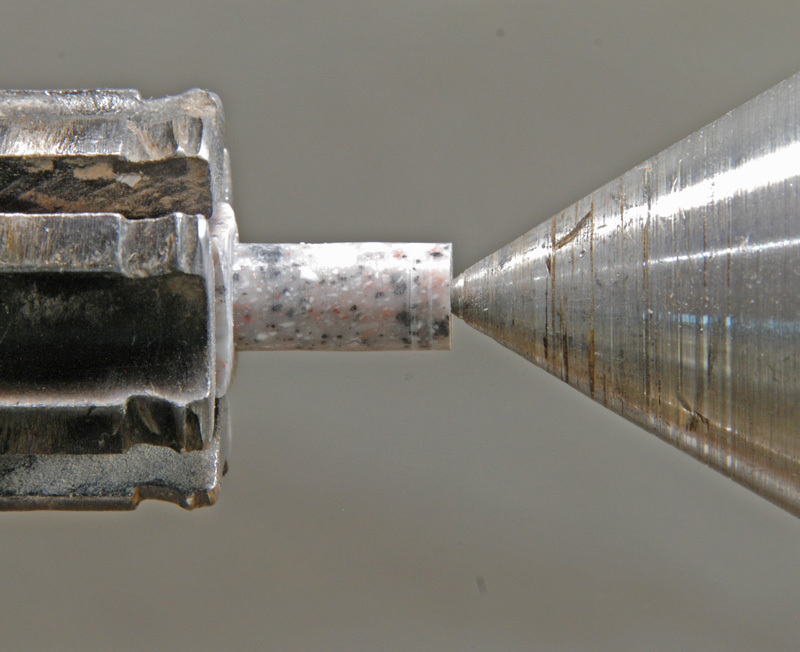 Create a starting dimple for the 5/16” drill bit with a skew or stub drill. 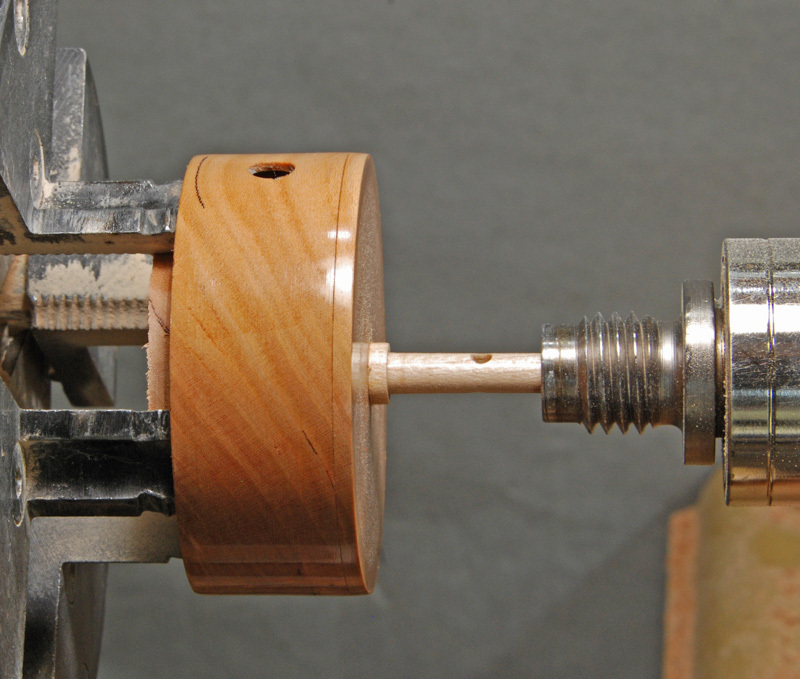 Now mount the drill chuck in your tailstock and drill to the marked depth as in Figure #8. 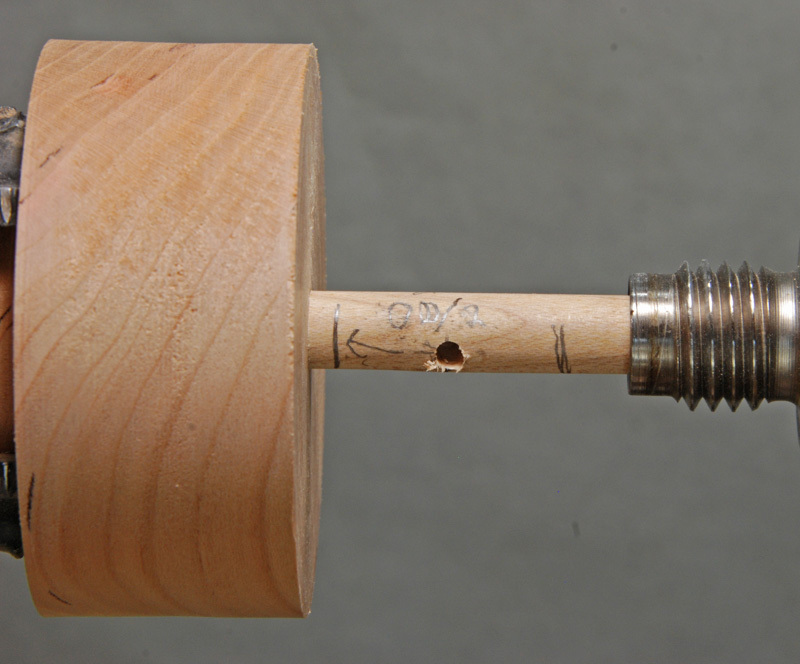 This hole will serve both as a mortice for the shaft and a depth indicator when hollowing the top. Figure #7: Mark drilling depth. Figure #8: Drill to the marked depth. Spread some wood glue in the mortice and insert the shaft tenon. 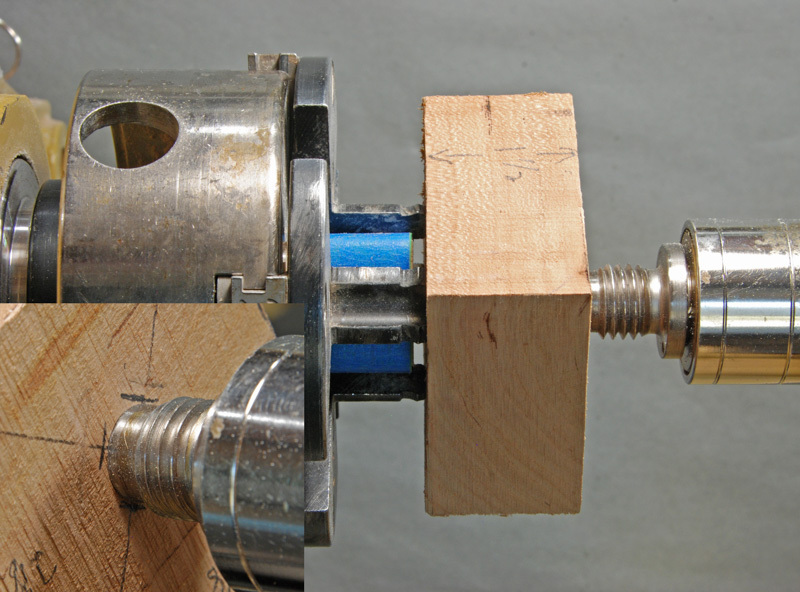 Use the cone tailstock center (with the center still removed) to clamp the shaft in place as in Figure #9. As the cup of the tailstock center is larger than 3/8”, if your shaft blank is reasonably close to being cut straight across the tailstock center will help center the shaft as well as serve as a clamp. Figure #9: Glue and clamp the shaft in place. Mark the shaft for turning. First mark a shoulder about 1/8” from the face of the body. Then hold your launcher (if you don’t have one, a 6” piece of 3/4" I.D. PVC pipe with a 5/32” hole drilled close to one end works well) with the side of the launcher at the shoulder mark. Mark the approximate center of the launcher hole for a pull string hole. Then mark a spot about 1/4” past the other end of the launcher. Drill a 1/8” hole through the shaft at the middle mark for the pull string. The result is shown in Figure #10. 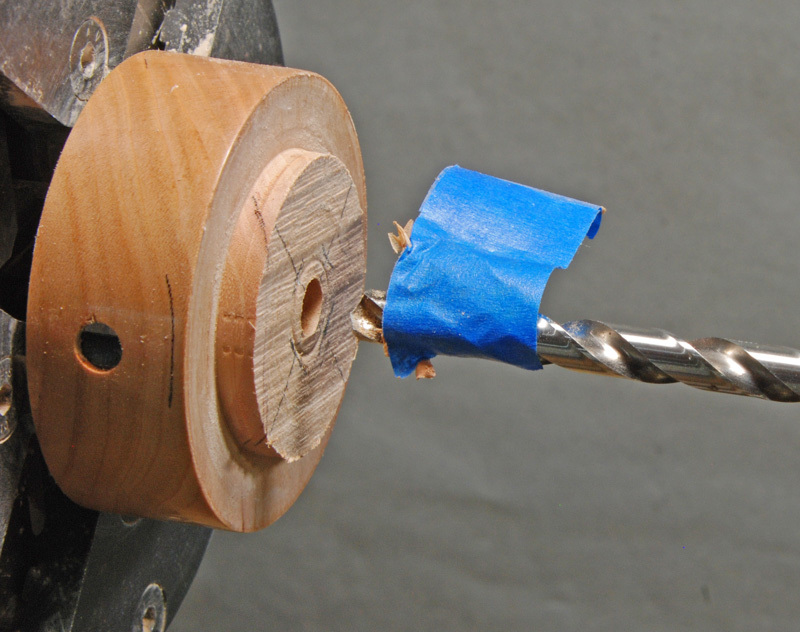 Figure #10: Mark the shaft for turning and drill a hole for the pull string. Turn between the shoulder and end marks to a diameter of 1/4". True up the shoulder and then part off the nub. Sand the top of the body and shaft. Polish the top face of the body and the shaft if you’re using a friction polish. The result is shown in Figure #11. 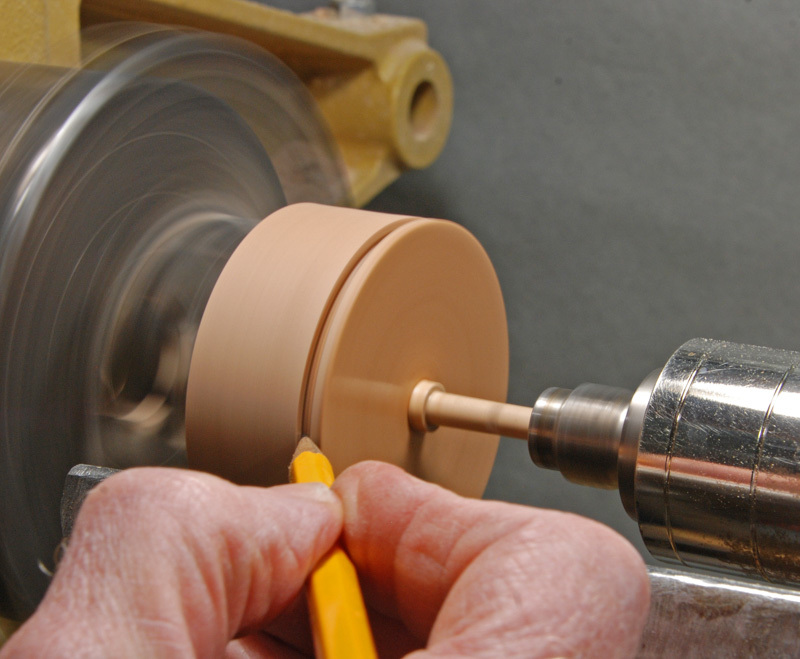 Figure #11: Turn the shaft, then sand and optionally polish the face of the top and shaft. Use a standard parting tool to make a cut about 3/32” to 1/8” (depending on how confident you feel about hollowing) deep about 1/16” from the face of the top body. Then use a 1/16” parting tool to part off the lid as in Figure #12. You will have to widen the slot so the narrow parting tool doesn’t bind and alternate cutting at the left and right of the slot. As a standard diamond profile parting tool is 3/16” wide this should leave a tenon about 1/16” deep on the cap. If you have difficulty with a deep parting cut with the 1/16” tool, simply start the cut and then finish with a small hand saw. It won’t show. Figure #12: Form the lid tenon and part off the lid. You can measure the diameter of the lid tenon and transfer the measurement to the top body. But there’s also a no-measure no-math way: Use the tailstock center to pin the top lid to the body. You’ll have to check visually that it’s centered. 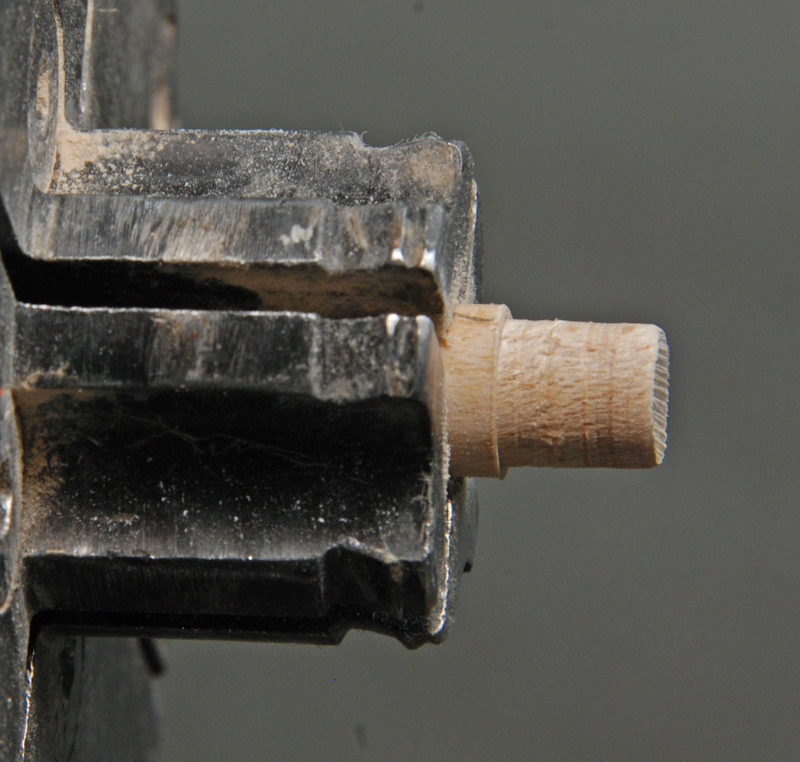 Turn the lathe on and stick a sharp pencil into the corner formed by the lid tenon and top body as in Figure #13. Just remember to start checking the fit a little further inside the line. Figure #13: Mark the top body for hollowing. Hollow the top body a little deeper than the lid tenon as in Figure #14, testing until the lid fits. As I didn’t get a clean parting cut across the shaft stub I hollowed a little deeper in the center. Figure #14: Shallowly hollow the top body to fit the lid. Align the top body in the chuck so that the side grain lines up with the chuck jaws. Put the lid in place. Pin it with the tailstock center if the fit isn’t tight enough to stay by itself. Line up a ruler with the middle of a jaw that aligns with the face grain of the body and find the center between the mounting tenon shoulder and the top of the lid and make a mark as in Figure #15. This will make the hole appear centered when the top is completed. Repeat for the other side. Drill shallow 9/32” holes at both marks as in Figure #16. 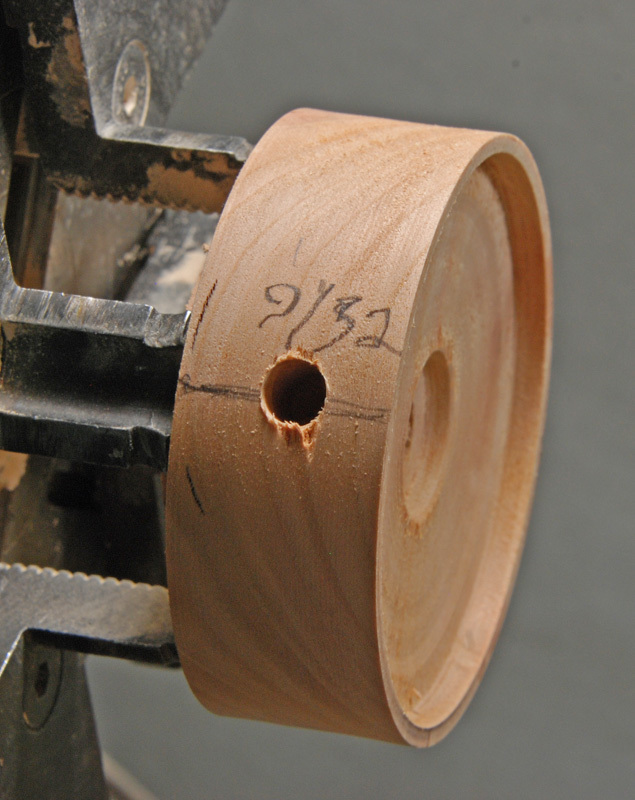 Drilling the holes before hollowing, and locating them on face grain makes clean holes more likely. Figure #16: Drill tone holes. Now hollow the body of the top to the depth of the depth drill as in Figure #17. Use whatever tools you like. You can remove most of the waste with a small bowl gouge and follow up with side cutting scrapers or shear scrapers. Be careful not to change the fit of the lid. Figure #17: Hollow the top body. Pin the lid back on the top body with the tailstock center. Refine the side of the top (thin the side if the side walls are more than 1/10” thick at the holes). Look ahead to Figure #23 if you want to tune the top now. Use a straw to blow across one of the holes. You may have to vary the angle—usually the straw should be angled down a little. Sand the side of the top and polish if you are using friction polish as in Figure #18. Figure #18: Thin, sand, and optionally polish the side of the top. 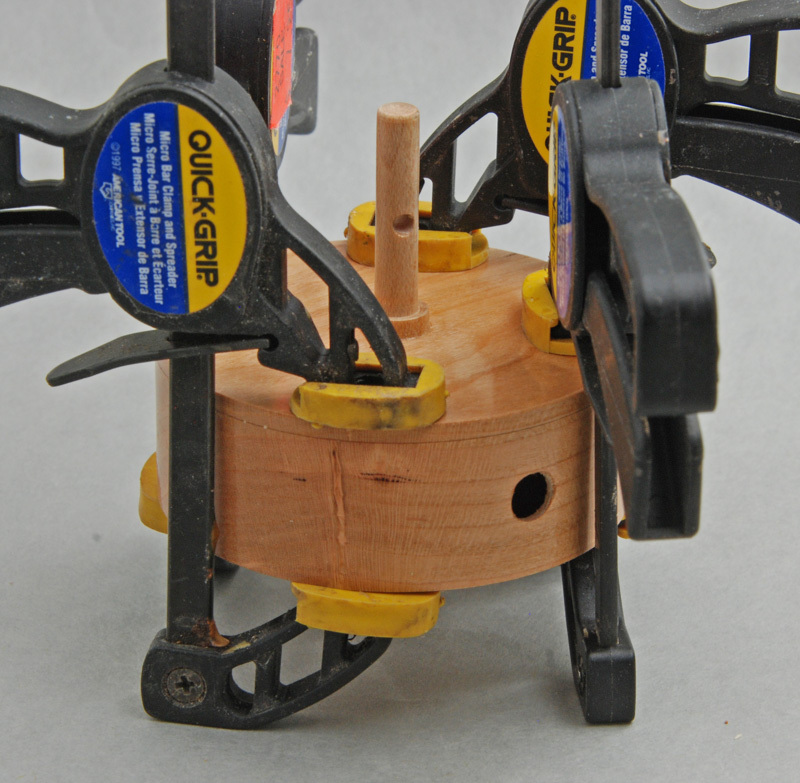 Remove the lid and reverse mount the top body on your 4-jawed chuck in expansion mode. Be gentle when expanding the chuck as the walls are thin—but test to make sure the grip is secure by trying to turn the top body. If you’re using the optional Corian tip, mark a 3/16” drill bit for a depth of about 1/4”. 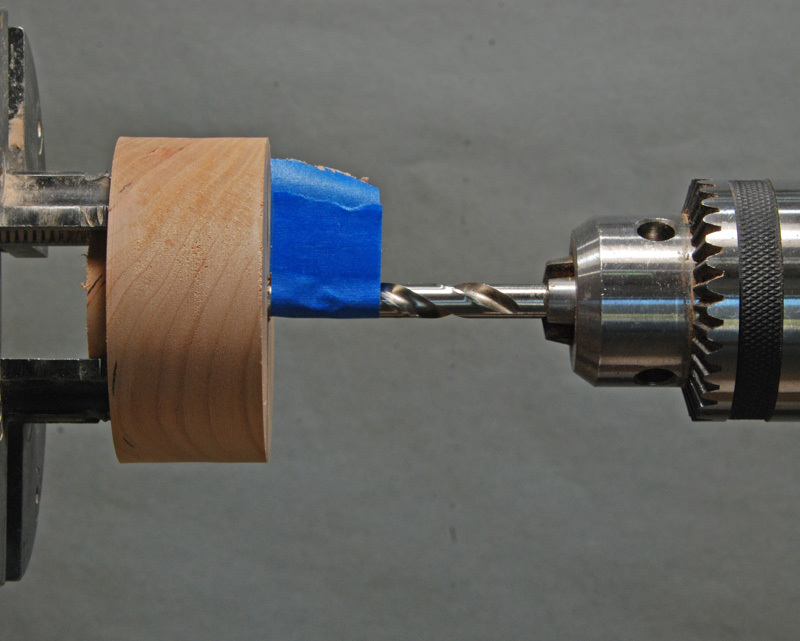 Create a dimple in the center of the top bottom with a spotting drill or with your skew, then mount the drill bit in a tailstock mounted Jacob’s chuck and drill in 1/4” as in Figure #19. Use CA glue to secure the Corian tip blank in the drilled hole and briefly clamp it in place with a tailstock center as in Figure #20. Figure #19: Drill for the Corian tip blank. Figure #20: Glue and clamp Corian tip. Cut off the excess Corian with a narrow parting tool (or by hand with a saw). 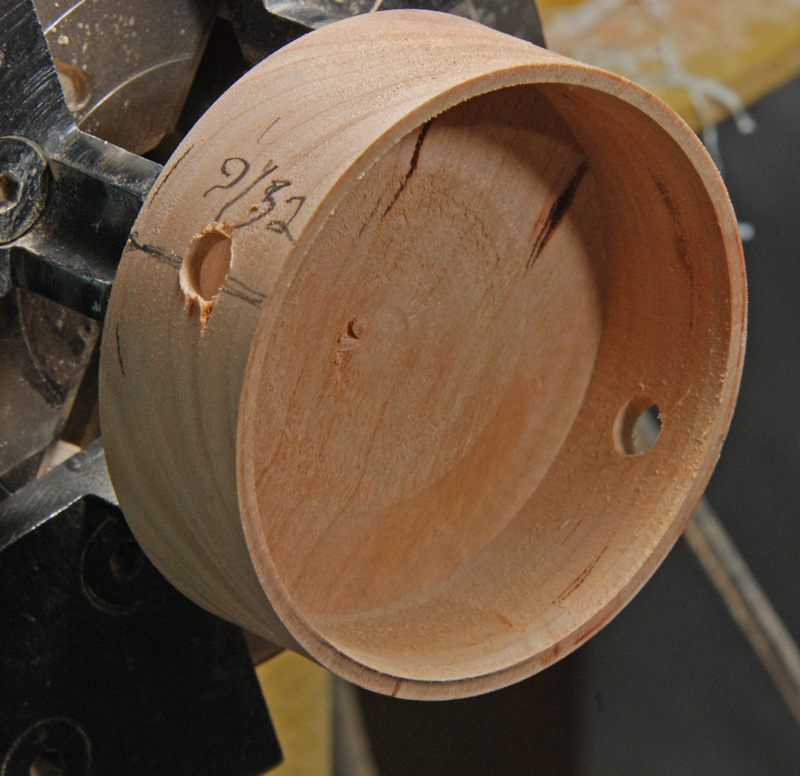 Turn a point on the bottom, blending the surface with the shoulder tenon. Then sand and optionally polish the top bottom as in Figure #21. Figure #21: Turn a point of the bottom of the top. Remove the top body from the chuck. Spread a thin coat of wood glue on the lid tenon and clamp the top together as in Figure #22 until the glue cures. If you’ve polished the top as you go, you should be able to wipe away any glue squeeze out before it sets. Figure #22: Glue and clamp the top lid on the body. Pre-test the top to see if it will whistle by blowing across an opening with a straw as in Figure #23. You may have change the angle of the straw—usually it has to be angled down somewhat. 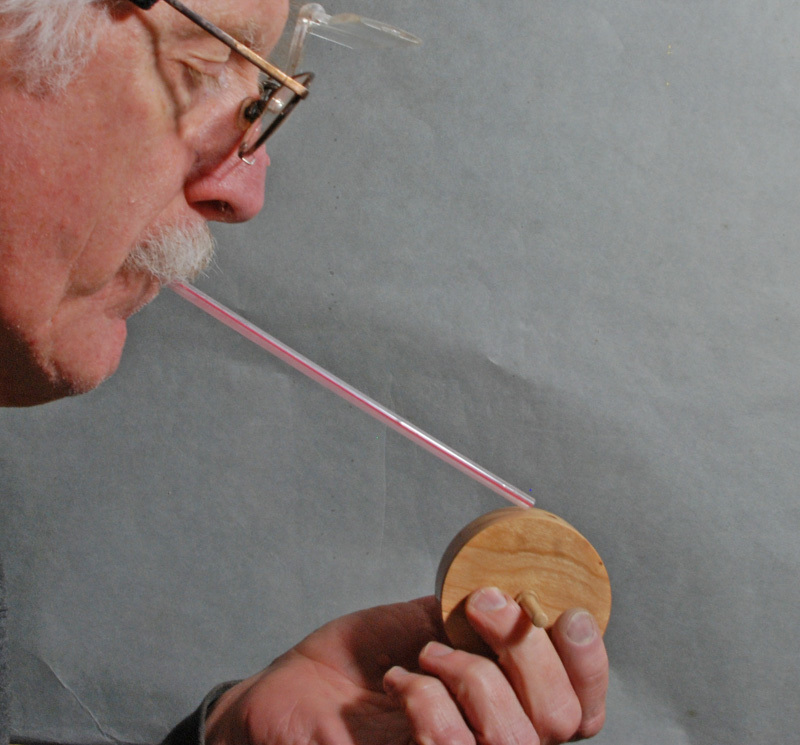 Making a whistle with the straw is necessary but not sufficient for whistling when spun, particularly with large holes. If you’ve followed the instructions in the article and thus have the same chamber volume as my top it really should work. If it doesn’t whistle, check to make sure the edges of the holes are sharp and clean. If you want to change the tone you can make it higher in pitch by enlarging the holes. You can usually enlarge the hole with a hand held drill bit 1/64” inch at a time without significant tear out. 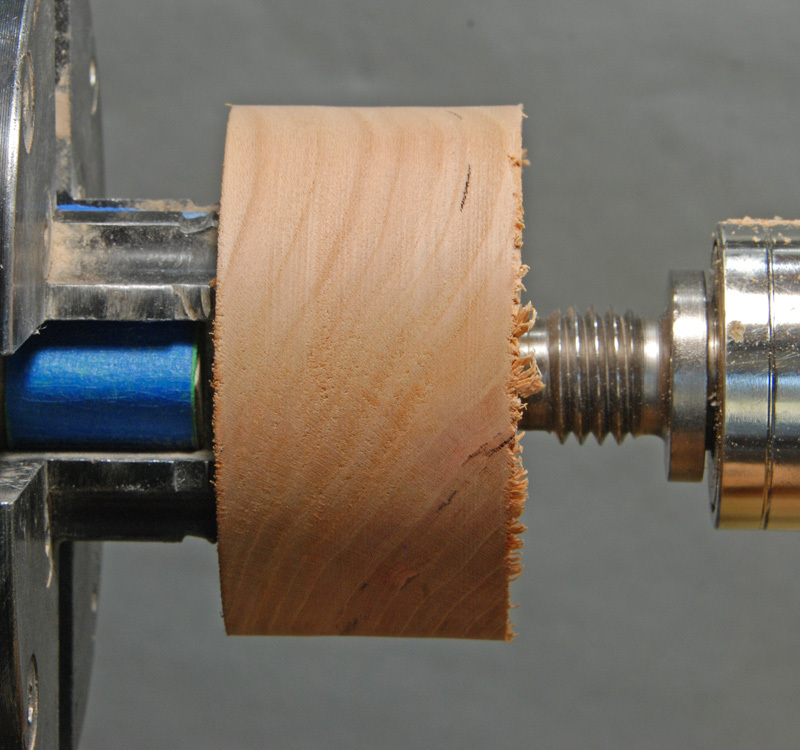 Alternately you can use a round file, rolled up sandpaper, or a mini-sanding drum on a rotary tool. I suggest that you not be greedy about trying for a higher pitch, as higher pitches require a higher rpm to work. Figure #24 shows the completed top. Figure #23: Test the top with a straw. Figure #24: The completed top. After you’ve gained confidence by making a basic whistling top work you may wish to try different materials, shapes, and sizes. For instance, the main photo shows an Acrylic top alongside the basic cherry top. This was made from a 1-1/2”x1-1/2”x1” acrylic blank and 1/2” clear acrylic rod. It has two 5/32” holes. The pull string hole is 3/32”, as a 1/8” hole made the shaft too fragile. But the top is lighter so a thinner pull string can be used.